It's a proven way to get a glowing complexion. You may have heard it referred to as blue light, red light, Omnilux or maybe Lite Luxe. 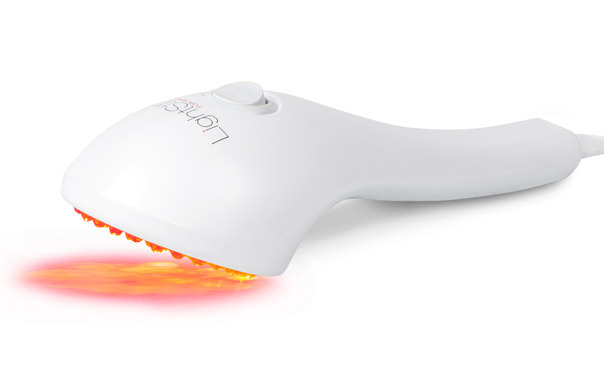 While Omnilux and Lite Luxe are actual brand names and red or blue light refers to the type of treatment (red is great for lines and wrinkles while blue is used to treat acne), essentially these are all forms of LED light therapy. Often used as a step in professional facials (after exfoliation and before hydration), LED is a proven anti-ageing method. Zoe Foster Blake uses it to get ready for the red carpet and she was a beauty editor for years, which is a good sign. "LED stands for Light Emitting Diode, which is a computer chip encased in a glass-like resin, which emits therapeutic wavelengths (or colours) of light energy," Steven Marchese, product developer for LightStim told The Huffington Post Australia. Not to be confused with laser, the light therapy was originally developed to fast-track the healing of wounds and post surgery scars. The rejuvenation of healthy skin, too, was a happy coincidence. "If the therapeutic light energy is in the correct wavelength, the cells in the dermis layer of skin will convert that light energy into ATP (adenosine triphosphate), which is the fuel that the cell uses to do its job. The fibroblast cells in the dermis layer have the job of producing collagen (which give the skin fullness or that plumped look) and elastin (which give the skin the ability to bounce back). Thus, LED gives the cells a 'full tank of fuel' and these fibroblast cells start to produce collagen and elastin like when one was 20-25 years old," Marchese said. The result is the complexion is plumped up with new collagen (which pushes the folds of the wrinkles out) and new elastin (which helps to tighten the skin and give it more elasticity). Sounds good, huh? Another draw card is that there's no downtime and it can be done in a lunch break. In-salon treatments are recommended two to three times a week for a course of four to six weeks. Ideal for pre-wedding prep or before a big event, a session only takes 20 minutes. It's also an effective and pain-free approach to treating skin concerns such as hyper-pigmentation and adult acne. The sensation is akin to lying in the sun (many people fall asleep) and the cost is either built into the price of the facial, or you can have it as a standalone treatment for around $60-$80. "LED is great for reducing the appearance of fine lines and wrinkles, improving uneven skin tone, reducing pores size, brightening the skin and rejuvenating the youthful look of your skin," Marchese said. "If you've lost weight recently, or have a poor diet, or you've spend too much time in the sun, etc., then it can take longer to see the start of results, but with continued use everyone can benefit from LED light therapy." While there has been conclusive studies into the effectiveness of LED light therapy, of course always listen to your skin therapist. "LED is the only aesthetic device that has no contra-indications of any kind. It is good for all skin types, colours and conditions. It is safe for the eyes and it cannot be overused. That said, it is always prudent to follow the manufacturer's instructions and to check with the manufacture if you are desiring to use the device in a manner not covered in the instructions," Marchese said. If you can't get to a salon for regular treatment, there are home devices on the market. While they're not as strong as in-salon devices, they're still effective.